Whether you approve of war or not, the essence of it would seem pretty clear: a nasty and brutish business. But this is not, nor has ever been, the consensus. What follows is a range, in five examples. It is perhaps significant that Ruskin never served in the military. 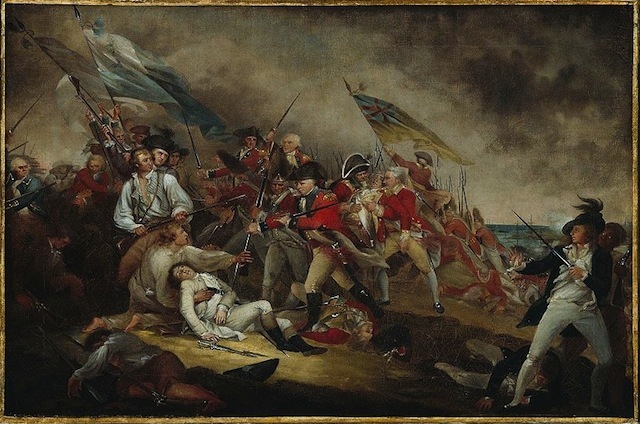 and smoke, but the focus is on the dying general being heroically defended from the English soldier’s bayonet by the man holding him, and by the English officer who gallantly restrains his uncouth subordinate. The rebel on the left refrains, for no apparent reason except moral admiration, from shooting anyone, while the figure in blue and white on the right looks on in amazement (he also provides a strong right angle to anchor the composition’s leftward-thrusting diagonals–but let’s stick to the subject). It’s Ruskin’s sort of war: noble, and full of virtuous display. 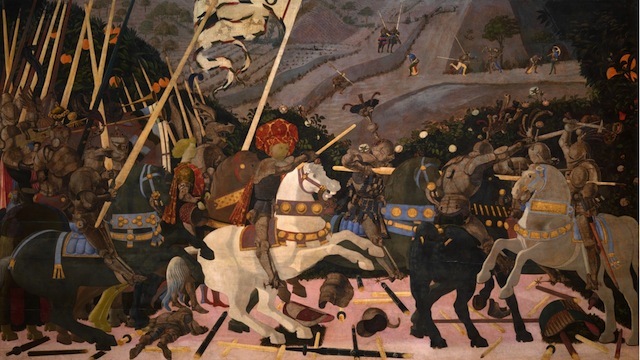 Paolo Uccello (1397 – 1475) had a more realistic sense of battle as having to do with fighting. This is not about gallantry or restraint–everyone is doing his best to whack the enemy. If the scene doesn’t strike us as savage–which it doesn’t–it’s because Uccello went for the decorative rather than the messy bits. The fallen armored figure on the left strikes us less as a dead man than as a tour de force of figurative perspective, a novelty in Uccello’s time. We’re spared the sermons, but the overwhelming impact is decorative grandeur rather than unpleasantness. 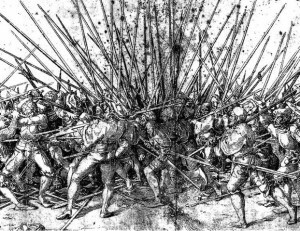 Seventy-five years later, Hans Holbein the Younger (1498 – 1543) went for realism, showing the pike men of the two sides so closely knotted up that they’re having trouble getting at each other. It’s also a striking abstract composition, but in Holbein’s case, unlike Uccello’s, the form intensifies the subject rather than distancing it. There are no discreet groupings with different agendas, as in the Trumbull. No moral uplift. You have to wonder what Ruskin would have made of it. And you really have to wonder what Ruskin would have thought of Tsukioka Yoshitoshi (1839 – 92), who made many weird and violent images. This is one. He’s definitely in Holbein’s camp. Like Holbein, he makes the jumble work for him both abstractly and descriptively. There is a general on a white horse, but he isn’t presented as an object of admiration. The theme of the thing is unbridled violence from top to bottom and side to side. 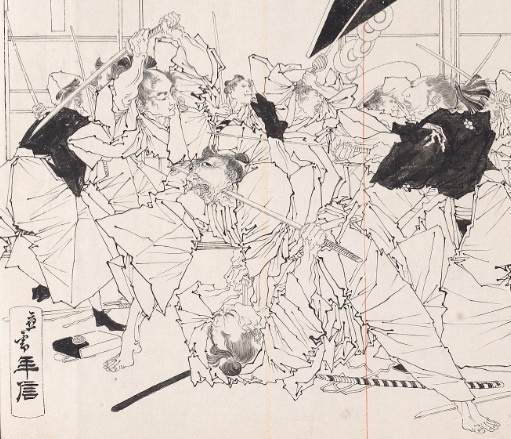 Even more intense, because on a more intimate scale, is “Fight Inside a Mansion” by Yamazaki Toshinobu (1857 – 1886). Here the design (the pen drawing for a woodcut that was never executed) amounts to a jumble of crisp silks and swords represented by hard, angular lines, abruptly interspersed with faces–some concentrated, some horrified, some in agony, all vivid. The abstract rigor of the whole makes it tougher–we see such madness with such clarity. Poor Ruskin–where are thy virtues and faculties now? And yet we always seem to find fighting necessary, and must be grateful for moral uplift where we can find it. Which, I imagine, is why my childhood history texts featured Trumbull rather than Holbein, Yoshitoshi, and Toshinobu.